A mitochondrial inherited bilateral condition, which appears suddenly in healthy people, primarily males, of about the age of 20 and results in a marked loss of vision and ultimately optic atrophy. 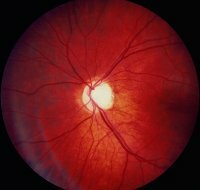 A very small percentage of people recover some visual acuity in one or both eyes after the disease has run its course (Fig. L6). Syn. Leber's disease; Leber's hereditary optic neuropathy. See optic atrophy; inheritance; mito-chondrion.